The lion-tailed macaque weighs 7 - 15 kg (15 - 33 lb). It is found in tropical evergreen forest, where it is omnivorous and diurnal and primarily arboreal. Groups of lion-tailed macaques range from 4 - 34 individuals. They usually contain about 10 - 20 individuals, including 1 - 3 adult males. The lion-tailed macaque has never been common. By 1971 it was known to occur only in the southern third of India, generally in the Western Ghats. In 1984 it was thought to occur in scattered locations in Karnataka, Kerala and Tamil Nadu. The major reason for its decline appears to have been habitat loss due to the spread of agriculture and teak, coffee, tea and other plantations. Formerly it was extensively captured for the pet trade, zoos and research, as well as for use in Oriental medicine. *** The lion-tailed macaque seems to be unable to adapt to human settlement; for example, it apparently doesn't travel through plantations or use them as habitat. 2004: Occurs in India (Karnataka, Kerala, Tamil Nadu) (IUCN 2004). The lion-tailed macaque has never been common. By 1971 it was known to occur only in the southern third of India, generally in the Western Ghats. In 1984 it was thought to occur in scattered locations in Karnataka, Kerala and Tamil Nadu, from the northern Kanara district of Karnataka in the north to the Ashambu Hills near the tip of the Indian subcontinent in the south (Groombridge 1984) . The population is severely fragmented (IUCN 2002) . The major reason for its decline appears to have been habitat loss due to the spread of agriculture and teak, coffee, tea and other plantations. Formerly it was extensively captured for the pet trade, zoos and research, as well as for use in Oriental medicine. The lion-tailed macaque weighs 7 - 15 kg (15 - 33 lb). 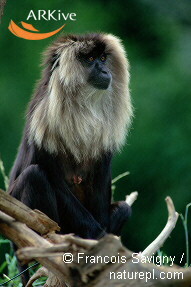 The lion-tailed macaque is found in tropical evergreen forest. 5 years (female); 8 years (male). Gestation in all macaques is about 5.5 months. The lion-tailed macaque is omnivorous. The lion-tailed macaque is mainly arboreal, although it does occasionally descend to the ground. All macaques are primarily diurnal. 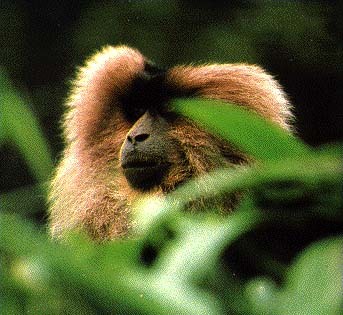 Groups of lion-tailed macaques range from 4 - 34 individuals. They usually contain about 10 - 20 individuals, including 1 - 3 adult males. A population density of 0.25 individuals/sq km (0.65 individuals/sq mi) has been reported. Estimated group range: 1 - 2 sq km (2.6 - 5.2 sq mi) over a 1 - 2 month period; 5 sq km (13 sq mi) over a year. One group had a core area of 300 hectares (750 acres) that was rarely entered by other groups. Minimum viable population density: 3.8 individuals/sq km (10 individuals/sq mi) (Silva & Downing 1994) .